Polar bears are the world’s largest land predator and the largest of all bears. Polar bears have been known to swim for 100 miles in a single stretch. 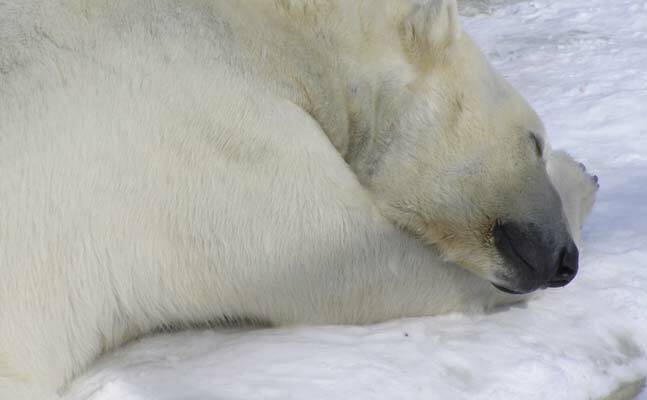 In the winter, polar bears develop a layer of fat that is up to 4 inches thick. Polar bears can smell seals up to 20 miles away. Como Zoo has embarked on its very own arctic adventure; a new home for polar bears – Polar Bear Odyssey. This world-class exhibit places bears in a natural environment that offers dramatically more land space and a multitude of opportunities for the bears to exhibit natural behaviors such as digging, swimming, foraging and hunting. Visitors delight in up-close and personal views of the world’s largest land predator. This year-round habitat offers a climate controlled “Outpost” to experience the bears all four seasons and wonderful open air views that will bring the polar bears as close as twenty feet. Polar Bear Odyssey emulates a Hudson Bay ecosystem complete with a river-washed stream, rocky cliffs and evergreen plantings. A 13,140 square foot outdoor habitat that is four times larger than the former polar bear exhibit. Two pools of various depths that provide the bears with options that mirror their native tundra habitat. One pool contains live fish for the bears to hunt. A 260 square foot digging pit filled with bark chips, gravel and sand. A 1,270 square foot “Outpost” building that provides visitors with year-round climate-controlled viewing experiences of the polar bears. 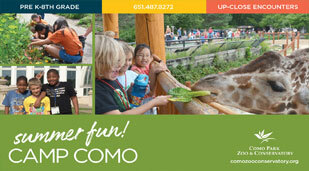 From the Outpost, visitors can observe bears swimming, hunting and playing through large floor to ceiling glass windows. A 650 square foot Lodge provides a great get-away for business meetings, education classes and private receptions. The Lodge has floor to ceiling windows looking out into Polar Bear Odyssey. Attached to the Lodge are the newest public restroom facilities at Como. Two separate habitat areas that can either be separated or joined by a corridor. This structure allows Como Zoo to separate the two habitats if housing a family group as the male bear must be isolated from the female and cubs. All land space in the habitat is covered with soil and gravel so the bears have a soft, natural surface to walk on. Two designated stations for the public to watch operant conditioning animal training sessions between zookeepers and polar bears. During training sessions, zookeepers teach bears specific behaviors that help the staff monitor the bears’ health and safety. For example, bears are taught to present their paws for inspection or to open their mouths to check on dental health. A 3,260 square foot state-of-the-art holding building to provide large indoor bedrooms, daylight, pools and a cub den.